Late last night the Scott for Florida legal team notched a couple more big wins. Judge Walker denied the Democrats’ motion for an injunction in their case challenging the state’s voter intent standards. Judge Walker also dismissed a lawsuit brought by the League of Women Voters and other liberal groups. As CNN’s Ryan Nobles put it, “the path to victory for Bill Nelson is quickly narrowing.” Playing whack-a-mole in court to knock down lawsuit after lawsuit (I think the Dems are up to 9 now) certainly isn’t how we had hoped to be spending the week after election day. But you have to ask yourself, is playing a mole getting whacked in court really how Bill Nelson wanted to spend the week after election day? With so much going on yesterday, it seemed like the biggest story of the day got lost in the shuffle, a bit. 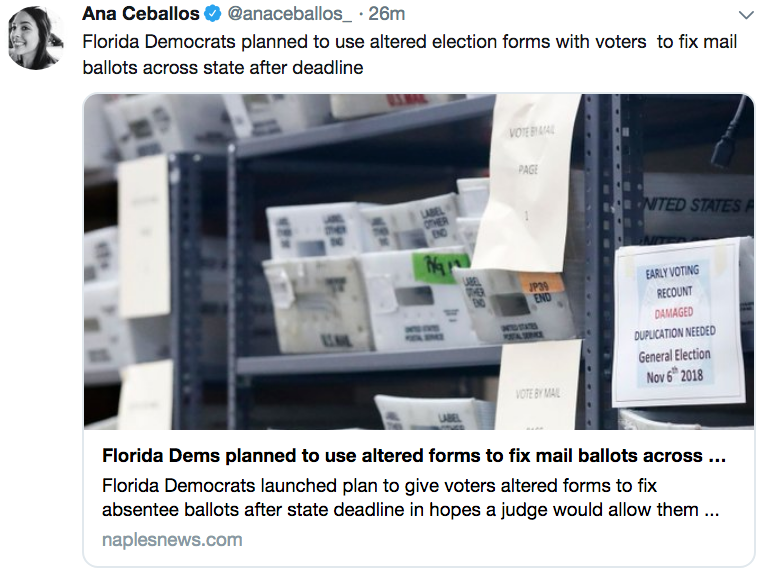 The Naples Daily News’ Ana Ceballos broke a bombshell story outlining how the Florida Democratic Party knowingly shared altered election documents urging voters to cure their absentee ballots by 5pm on the Thursday after election day. The deadline in state law to cure absentee ballots in 5pm on the day before election day. But it gets worse. According to activists in the know, they did this purposefully in hopes that a judge would rule to eventually include ballots cured after election day. It’s hard to look at this as anything other than a coordinated effort by the Florida Democratic Party and the Nelson Campaign to fraudulently mislead voters to submit invalid affidavits and then argue in court that absentee ballots cured late should count. Yesterday, in response to this story, Scott for Florida Campaign Manager Jackie Schutz Zeckman called on Bill Nelson to immediately demand the resignation of the Florida Democratic Party Chair. “News reports yesterday and today revealed that the Florida Democrat Party engaged in an illegal scheme to alter election forms and deceive voters regarding the deadlines for submitting votes. Democrats even admitted plans to fraudulently mislead voters in anticipation of including ballots submitted after the legal deadline if they could convince a judge to disregard Florida election law. Federal prosecutors are also investigating this clear example of voter fraud by the Democrat Party in Florida. 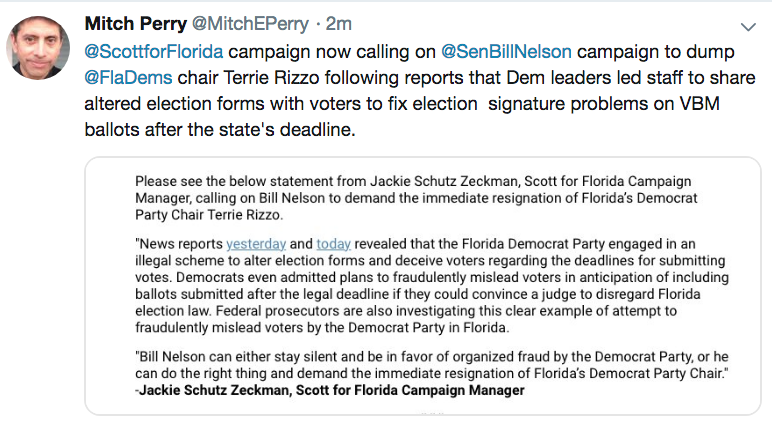 This seems like the obvious thing to do – unless, of course, Bill Nelson has no problem with the fraud committed by the Florida Democratic Party.